Today marks the second bake sale supporting my company's drive to raise money for the Aids and Breast Cancer Emergency Funds . The fund-raising culminates in a grand spelling bee competition at the beginning of December. This year, I volunteered to coordinate a series of weekly bake sales to try and help raise some extra money for the cause. Today we had the second of our five bake sales. The theme this week was "International - Around the World". This is one of the three items I contributed this week, more on the others later. 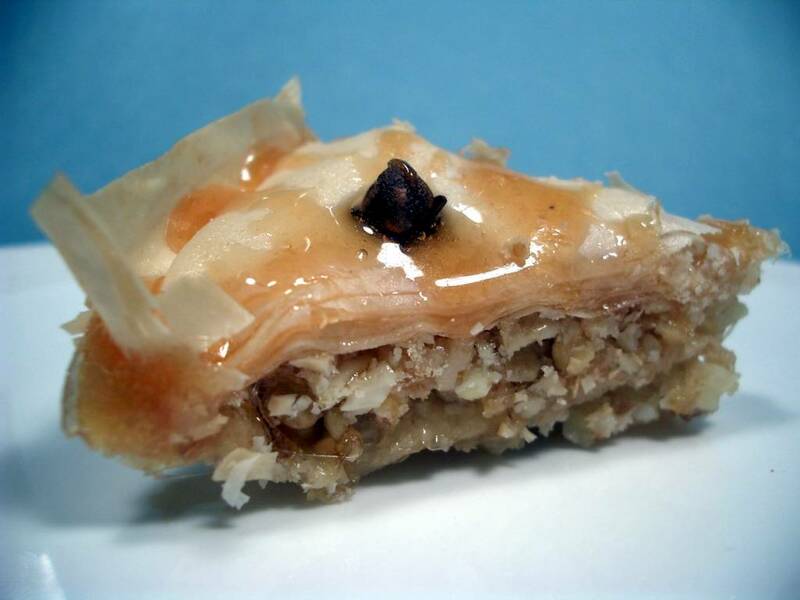 I made these delicious, chewy, nutty, little Baklava using the recipe here. I followed the recipe pretty exactly except I used Orange Blossom, instead of Chestnut honey. Tip: Be organised. Don't forget to buy the Filo pastry the day before so you have enough time to defrost it properly! Defrost overnight in the fridge and then leave at room temperature for 2 hours before use for the best results. Other yummy contributions from colleagues for today's bake sale included German Almond Cakes, Armenian cookies, Hawaiian Pineapple and coconut cup cakes and Scottish shortbread. I won't be announcing how much money the bake sales raised until the beginning of December. Looks like a very sweet way to commit suicide by sugar overdose...Whohoo! people at work are already stopping me in the hallways to blame me for their weight gain problems due to my bake sales. But I don't think their lack of discipline is my problem. Unfortunately for me, I HAVE to taste absolutely everything before I sell it. But its for a good cause! How can I can complain. Two down, three weeks to go, and I must get me down the gym, I guess! PS - Del - did you enlarge the picture? It looks doubly sinful when you enlarge it! That looks so delicious! I'll definitely have to try it out sometime. I think your photo will be the favourite to win next month's DMBLGiT competition! thanks Clement. You know how much I admire your photos so the compliment from you is even more meaningful. I am trying hard to improve my photography all the time. And I am still waiting for the new camera to arrive so I hope that will help even more!